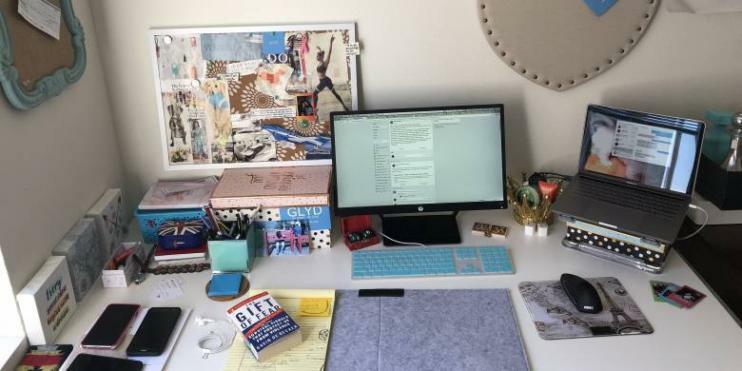 We asked 16 business leaders of startups, established companies and multinational giants what their work desks look like, and what it means to them. Here's why they keep their workspaces the way they do. Have you ever wondered what some of the most influential business leaders work desk looks like? Are they tidy or messy? Do they have pictures of loved ones or gadgets close to hand? And why do they keep their desk that way? Is it a place of function to get work done, or an area of creativity and a home away from home? Let’s find out. Monika Bhasin is a founder of GLYD, an app that connects travellers with local guides. She also has pictures of her husband and dogs on her desk to remind me of how much she’s loved and blessed. She also has a golden crown full of beauty products (“to remind me I AM the queen!”). Rupert launched SpareRoom in 2004 in the UK and in 2016 expanded it across to the US, leading to them having offices in London, Manchester and New York. He tends to move between SpareRoom’s offices in London, Manchester and New York and he also works from home when he needs quiet time to work on something particularly sensitive. “This is the desk in my 18th century home in East London,” he says. The Inner Circle is a popular global dating and socialising website, that aims to provide a quality over quantity experience. Understandably, Krayenhoff’s desk is his compass for navigating the challenging world of entrepreneurship and dating. “The orange book is my bible of Dutch courage. Its where the magic happens,” he says. Jeff Kelisky is the CEO of Seedrs, with a long track record in building, scaling and leading successful technology businesses. His goal for Seedrs is to unlock and capitalise on the opportunities that the asset class provides whilst leading the company through its transition from startup to scaleup. His desk features a range of personal, memorable and inspiring flourishes. From his toy Snoke, a gift from his son, to his daughter’s SpongeBob SquarePants keychain, Kelisky keeps reminders of special memories from his children to keep him grounded. Kelisky’s desk also features a range of books, including The Hard Thing about Hard Things, Scientific Progress Goes “Boink” and Uncle Petros and Golbach’s Conjecture. His desktop includes pictures from a special day when he met Andy Murray and his son got to play a game with him. James Constantinou is a founder of Prestige Pawnbrokers, and a star of Channel 4’s Posh Pawn. “My desk is large and imposing in my office,” he says. Rebecca is a founder of Get Ahead VA, a virtual assistant business support agency. “I have a height adjustable desk which allows me to sit or stand,” she says. Elliot Gold and David Kosky are co-founders of Work.Life, which provides vibrant workspaces for businesses of all sizes. Gold’s desk is centred on his laptop – his mobile office. He keeps a number of personal effects and work items on his desk, including a bank pin reader, a notebook and his to-do list – which he’d be lost without. Work.Life’s co-founder David Kosky likes to keep his desk clear, with a few bits of greenery and close to a window with lots of natural light. Bhavin Shah is a behavioural optometrist, children’s vision specialist and CEO of Central Vision Opticians. Bhavin Shah, CEO of Central Vision Opticians keeps toys on his desk–for work! Carly’s business, Anaphase Store, is an online business that designs slogans and prints, supported by the Prince’s Trust and is based in Cardiff. Thompsett is a sole owner, so her desk is full of “random stuff”, she says, including her invitation to Buckingham Palace from May, the certificate she received for passing an employment law course and an article from the paper she was featured in. Andy Lawson is founder and CEO of BoroughBox which is reinventing the supply chain for the independent food and drinks businesses. It’s a digital marketplace that connects thousands of customers to independent food and drinks businesses each month. The company has a rapidly growing fulfillment division that offers logistics solutions and enhanced retail and distribution opportunities for the businesses on the platform. Michelle Kennedy is a founder of the community app Peanut that connects like-minded mothers. “What you can’t see in this image are the boxes of Peanut swag tucked behind me, which makes the office extremely ‘cosy’,” she says. Sam Bruce is an owner of Much Better Adventures, a travel company that helps people to arrange proper adventure holidays with handpicked local guides, supporting conservation with every booking. Jason Droege is a vice president and head of UberEverything where he leads the Uber Eats team. Uber Eats works with over 160,000 restaurants in 350 markets across 35 countries and delivers food in under 31 minutes. Droege’s expertise as a successful founder and business leader across e-commerce, enterprise software, and internet services helped him lead the team that created Uber’s first app outside of rides. Droege enjoys testing Uber Eats features by delivering Eats meals via bike and ordering lunch from local San Francisco restaurants, so it makes sense for him to keep little mementos from each of these eateries. He also enjoys collecting artifacts from the past few years, including when Uber Eats recreated the pizza delivery service Little Nero’s Pizza from “Home Alone”. He regularly visits international Uber offices and picks up items like Uber Eats refrigerator magnets. Aron Gelbard is the founder of the second fastest growing business in the UK – Bloom and Wild. Gelbard believes less is more. He keeps his desk pretty tidy to declutter the space around him and as well as his mind. He has a pretty hectic schedule looking after Bloom and Wild’s growth markets in the UK, France, and Germany. Instead of lots of florals, he has a small pot of Jamie succulents on his desk which just needs a spritz every other week. Easy! Cally Russell is CEO of Mallzee, a non-retailer shopping app with over 1.5 million users and featuring hundreds of high street retailers. Since launch Mallzee has won tech and retail awards including being named by Apple as the best new app. How do you keep your work desk? Is there method to the madness? Share your story with us for a chance to be featured on Real Business.